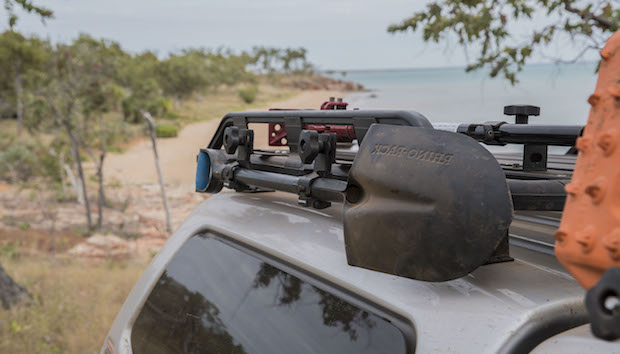 Whether you’re an outback adventurer covering remote Australian roads or a weekend warrior looking to escape the city, the Rhino-Rack Shovel Mounting Bracket is the perfect accessory to keep your shovel at the ready when you need to dig yourself out of snow, sand, mud or any other type of terrain. The Rhino-Rack Pioneer Shovel Mounting Bracket mounts directly onto the Rhino-Rack Vortex crossbars or Rhino-Rack Pioneer systems. Rhino-Rack’s Pioneer systems were designed to maximise your load capability while freeing up space inside your vehicle for ultimate comfort on the road. With easy installation and removal, you will be able to mount a shovel onto your vehicle with multiple configuration options. The brackets can be inverted to position the shovel above or below the tray and the hinged design allows mounting of a wide variety of handles as well. The safe and secure roof system holds your tools to prevent any cabin damage from occurring. Constructed from steel with a high quality powder coated finish, this mount bracket is built to last and to hold your shovel in place for the rough road ahead. Backed by a 3-year warranty, the Rhino-Rack Pioneer Shovel Mounting Bracket is a must for any adventurer looking to take their outdoor pursuits to the next level.